Cyma Architects and Roger Joyce Associates held a Private View at George's House on 11th October to celebrate the merger of their practices. Two Folkestone based RIBA Chartered Architects' Practices, Cyma Architects and Roger Joyce Associates have merged. 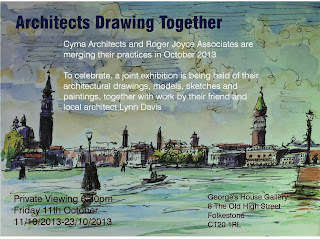 Cyma Architects formally incorporated Roger Joyce Associates in October. The two directs of Cyma, Mark Hall and Charles Bain Smith have enjoyed working with Roger Joyce for a while now, having involved themselves in similar work on historic buildings and new buildings in areas of heritage sensitivity and more recently it seemed like an excellent idea to combine the practices. Roger's long experience will be of great benefit to Cyma which was formed in 2000. Roger will continue to carry out his ecclesiastical work under his own name. Cyma moved from Ashford to Folkestone because of the opportunities presented in reviving the town. the combined practice hopes to establish itself as a bridge between conserving the heritage of the town and making the exciting changes needed to sustain it for the future. See Folkestone Creative November/December 2013 for an article on the preview.